We just finished up a successful weekend in California at the Pleasanton Open. 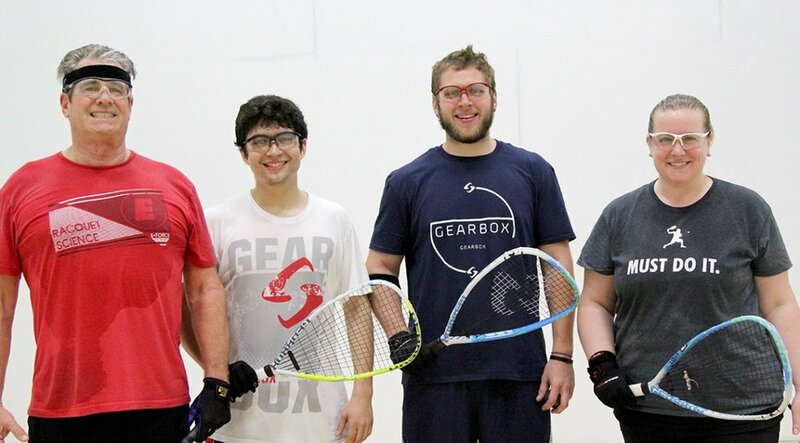 While the World Racquetball Tour held another exciting and successful tour stop, our RYDF players competed well both on the tour side and the Pro Am side. Many friends of Reaching Your Dream who support us participated in the round robin format of the Pro Am, as they were paired up with many of our players. The competition, though friendly, was filled with intense play. All of the young pros played very hard and worked respectfully with their patrons. Overall, it proved to be one of the main highlights of the weekend. Featured in the picture are Pro Am winners Kim Randolph and her partner, Jake Bredenbeck and runner ups Barry Clyde and Francisco Troncoso. For some of our players, it’s not all play. The WRT works very hard to provide a quality product with their live streaming. It benefits the fans as they get to enjoy high quality professional racquetball at home. But it also benefits many of the players, by giving them valuable experience contributing to tour operations and sometimes assisting the production crew. If you are familiar with the WRT feeds, you will often hear our players providing color commentary during matches. But there is also an added benefit for the players as the tour production grows, they get a chance to get hands on experience working with the production crew working the cameras and sometimes helping with the set ups. Manning the camera for the finals is the very popular Cocco Hayes, an up and coming 21 year old from one of Mexico’s main racquetball cities, San Luis Potosi. These are the kinds of results we like to take away from these events. All positive. WRT’s Laura McCormick with Americans David Bobby Horn (#4 on the tour) and Jake Bredenbeck (#3). Jake and Bobby were first and second in last years U.S. Nationals and represented the USA in world competitions and will again in March in the Dominican Republic.